CeX Berkeley got the ball rolling with their first instalment of their Monthly Gaming Tournaments. Kicking off their dynamic new gaming area upstairs, an open invite went out to all in the name of Mortal Kombat. The atmosphere was electric. Oh’s and ah’s, pizza, shouting were all part of the ambience as the intense tourney went on for the better part of two intense hours culminating in an epic best-of-five match to determine the first CeX Gaming champion. The two good friends, who arrived at the tournament together, would face one another in the end of the Double Elimination tournament. Battling on through the fifth match, and ultimately tournament point, the two went blow for blow, knowing the other’s strategies. It was fight pad versus fight stick, the sound of plastic slapping plastic was intense. Block, advancing guard, attack, the final matches went on for the better part of twenty minutes as excitement continued to build amongst the spectators. Finally, with one last “Fatality”, the Winner Evan H. would claim his prize of $50 store credit. CeX couldn’t have hoped for a better start to their monthly gaming tournament series. 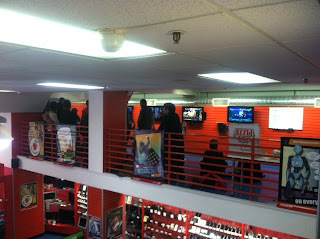 Next tournament - Street Fighter X Tekken - April 14th - CeX Berkeley Will you be there?